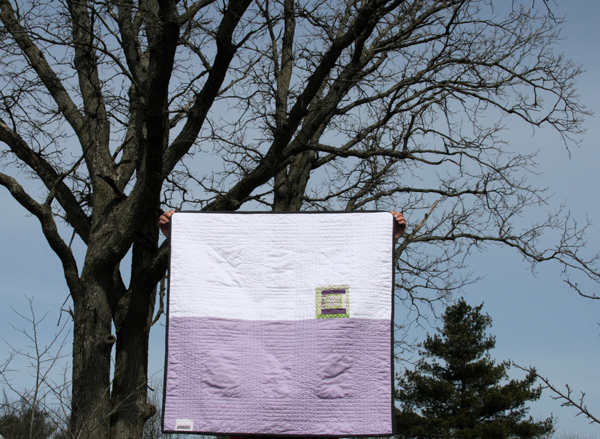 A spring quilt for a nice spring day! 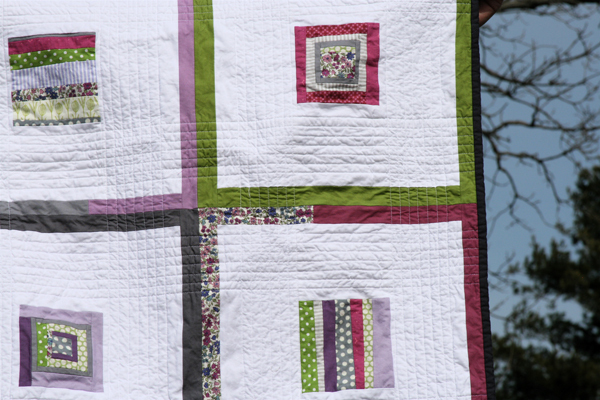 The inspiration for this little quilt is from my favorite picture frames. I love the oversized matting with the little tiny picture in the center. We have one in our kitchen and every time I look at it I see a quilt. In fact, I was considering going with this idea for my month for the Bee Imaginative quilting bee (which is why these fabrics will look very familiar to my bee members!). At the last minute I went with something else, but decided to finish up this quilt as a little sample. My big dilemma was how to quilt it. Since there’s so much solid white space, I wanted the quilting to add some interest. I decided to go with straight lines surrounding the center blocks. I think it fills the white space nicely, and I love the patterns where the lines cross. 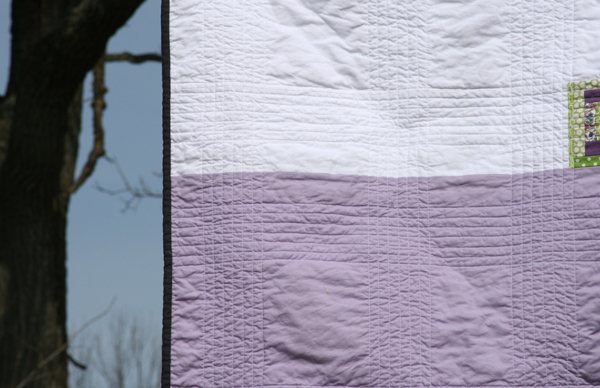 The back is simple – some white and some purple, with one little extra block for interest. It measures about 30″ square. I don’t have a plan for this one yet – it might end up on one of our walls, or it might show up in the shop! 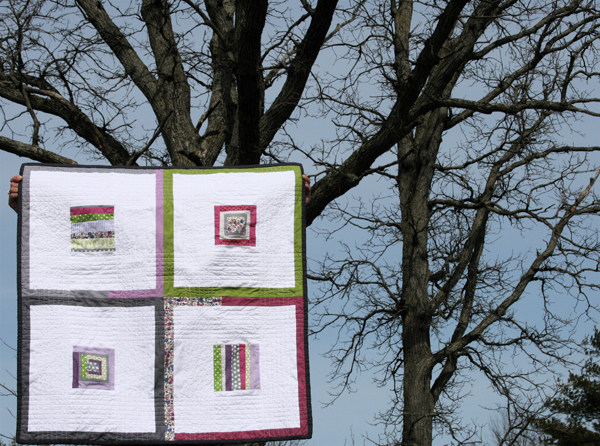 This entry was posted in [search] Wonky/Improv Quilts, 2010 Finished Quilts, Finished Quilts, Posts about Quilts, Quilts and tagged green, handmade, mini blocks, mini quilt, modern, purple, quilt, Quilt Blocks, quilting, spring, wall hanging, wonky log cabin, wonky stripes. Bookmark the permalink. do you have a favorite kona solid? I really love this color combination and the quilting is fantastic! Love your use of white and especially the quilting! This is lovely! The colors are great, and I really like how you framed each square in such a bold way. You never cease to suprise me with your quilts! I just love this one. It seems so simple … yet very elegant and complex. How do you do that???? This is so great! You have the best ideas for using your scraps too. I love this! The mini blocks are awesome, and I love the way you’ve quilted it! such great colors. I really like oversized mats for pictures as well. Great idea for a quilt! I love it!! I also love those frames…what an awesome way to pull inspiration. I adore this quilt! I love hearing about what inspired you, and the process you took from those cool frames. I love how the wide white borders really make the small blocks pop out. And I love that you used different blocks. The quilting really pulls everything together! I see a little Liberty of London for Target in there, no? Wow, I love everything about it! The quilting on the white makes it extra special. This is great! I am starting to enjoy small blocks in a sea of white. Might have to try that myself soon. I love your quilts. I noticed that you usually quilt randomly but in this on you decided to go with straight lines and squares… I was wondering do you quilt by hand or with a sewing machine? I have tried to learn to use the sewing machine but I’m terrible and prefer to quilt by hand. Anyways, congratulations on your work, it’s lovely. That quilt is just gorgeous! I love the sea of white around the little blocks. You always come up with great ideas! That’s why I keep comin’ back. Another beautiful design! I follow your blog and it has helped my quilting so much, I just finished a baby quilt for a neighbor last night and my family has commented on my improved quilting…..I attribute a lot of that to your inspiration. Thank-you for continuing to share and encourage! very cute!! i just got your bee fabric.. now the block making pressure starts!!! 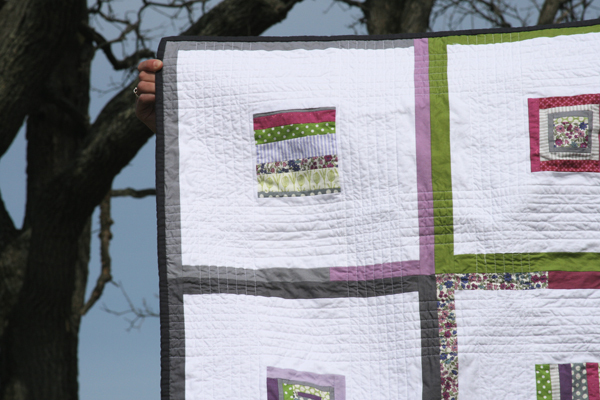 I love the fabrics you used in this quilt…those colors make me happy for spring. But I really love where your inspiration came from. I have those frames in my home as well & think a quilt that pulls from their design is great! I love your quilting! I am quilting a quilt with straight lines right now, but I keep catching the fabric underneath. Any secrets? Maybe it’s a thing you learn with time. I thought I pinned well. But here and there – it makes me mad. Maybe it will dissapear when done? I’m not sure. But yours is very cute!